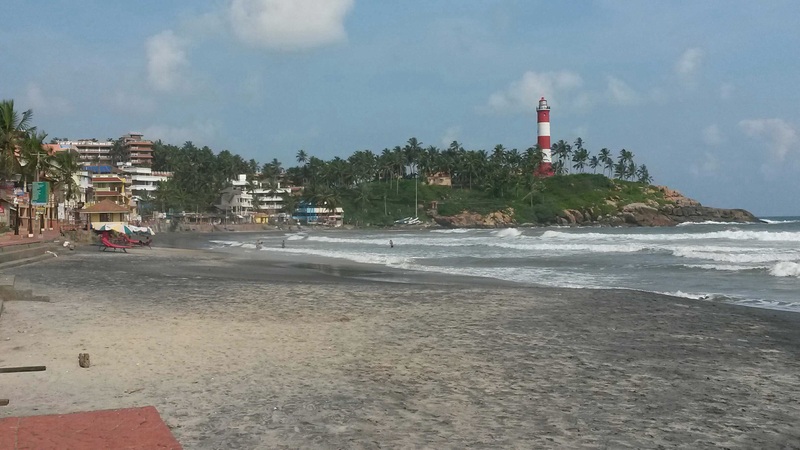 Kovalam beach came ‘highly, highly recommended’ by Robin, our guesthouse owner and manager and is often cited in guide books as one of the best beaches in Kerela. Travelling outside of the tourist season has it’s advantages, potentially cheaper accommodation prices and no hoards of tourists! Of course the downside is, when spotted by a persistent beach seller, we can’t dissappear into a crowd! Today it seems we are the only Westerners on the beach and ‘fair game’ for the sellers! First we were approached by a tall, well built man with the biggest beaming smile I have seen in a long time! We immediately said a polite, ‘no thank you’ but he ignored our retort and proceeded to show us, one by one, the large bundle of multi-coloured scarves on his arm, which were in a variety of patterns and fabrics. He seemed particularly keen to sell us some ‘good quality silk’ probably because these were the most expensive. Before we knew it, another small, older looking man appeared and began to show us some Indian pictures, painted on banana leaves. If I didn’t need or want a scarf, I certainly didn’t need or want some pictures, that would end up in a drawer back home! Again, we said ‘no thank you’ but this was ignored and he too, began to show us his full product range. We kept saying that we didn’t need any, didn’t want any but slowly they seemed to be drawing me in. Then the smiling man hit me with a phrase, which I’m sure was a sales tactic, but really pushed the guilt button ‘if you buy something, I can then eat lunch’. The fact he was a rather large man, hadn’t escaped my attention, so he didn’t appear to be starving but still, his phrase rang loudly in my ears. Eventually, we said to both sellers ‘maybe later’ which in our minds was a gentle way of saying ‘no’ but little did we know that this subtle brush off was the phrase that would seal our purchasing fate! As we ate lunch, gazing out over the sandy beach and crashing waves, I couldn’t believe it, when I saw both salesman, waving at me! Every time I looked out, they were there, they had their sights set us and there was nowhere for us to hide! As I sat there eating my lunch, the smiling man’s phrase about earning money to buy his lunch, kept playing on my mind. The rational, synical part of me, knew this was probably a tactic, tug on the tourist’s heart strings and they’ll give you their money…but it seemed to work. As we ate, we felt like we were under surveilance, being circled by sharks and we were the bait! Their persistance was admirable albeit a little intimidating! As our lunch came to an end, we knew the fate that awaited us. The first price the scarf seller had told us before lunch was 200 Rupees, roughly £2.50 but he no longer wanted to sell us something at this price, 500 Rupees was his new opening offer. ‘What happened to 200 you told us before lunch’ I said, he just smiled and continued to show us the more expensive range. He really didn’t want to sell us something for 200 Rupees but I stood my ground and said that I only had 200 to spend and he could either sell us something for 200 or not at all, so he relented and we bought a scarf for 200 but he looked very annoyed. By this time, we were hot and tired, so the picture seller really had no chance! We just kept repeating ‘no thank you’ and walked away. An hour later, a different scarf seller caught us as we were sitting on a wall. His name was Surri, he was a small, older man, who seemed to want to talk as much as sell us things. 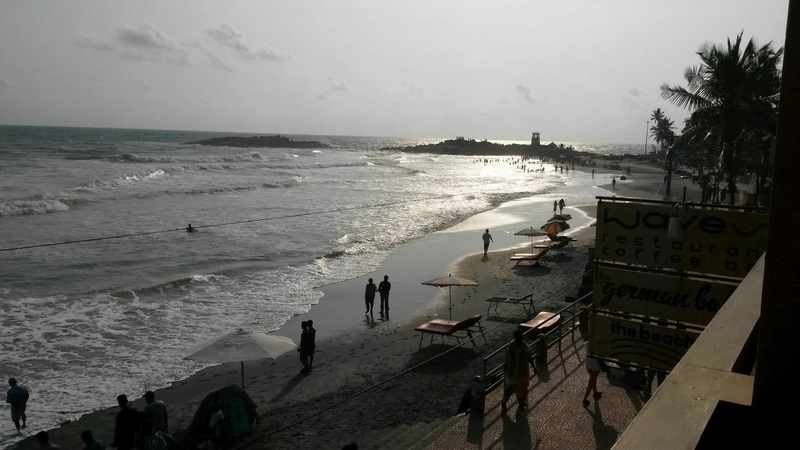 He began to tell me, in a mixture of Malayalam (the local language) and English about his five children who were in school which he had to pay for, his 20km commute to the beach to do his work and how work was very slow as the tourist season had ended. For the next half hour he proceeded to unfold and show us almost every scarf and wraparound skirt he had. I felt he had put a lot of time and effort into showing me his wares, so I relented and bought a skirt, another 200 rupees! That’s it, I said to Richard, no more buying things I don’t need or want. Time to switch off the empathy for the beach sellers methinks!